Ohio Wesleyan University’s Stewart Annex, 70 S. Sandusky St. in Delaware, is scheduled to be renovated in the coming months to house the Delaware Entrepreneurial Center, a joint venture between the university, City of Delaware, and Delaware County. “Over half of our residents indicated at that time that economic development — creating new jobs and working with the businesses that are here — is a top priority,” he said. Jane Hawes, communications manager for the Delaware County Board of Commissioners, said the board has yet to make a decision on the joint venture agreement, but it could come as soon as next month. “It is anticipated that our Economic Development Director Bob Lamb will request that the proposal be added to the commissioners’ Feb. 12 agenda to discuss and potentially vote on it then,” Hawes said. If approved by council and the county commissioners, the joint venture agreement calls for the Delaware Entrepreneurial Center to be located in OWU’s Stewart Annex building, located adjacent to the Richard M. Ross Art Museum on South Sandusky Street. As owner of the building, the university would be in charge of managing and paying for all renovations to the building. To help cover operational costs, the city and county would agree to each pay $50,000 a year over the next five years. 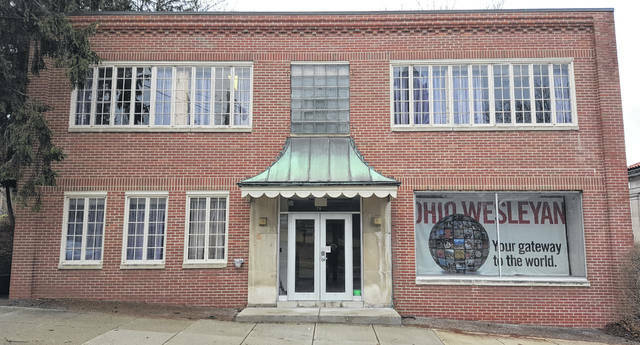 Representatives from OWU who addressed council said once the Stewart Annex is renovated, it will include educational space, areas for networking and engagement, larger offices for startups further along in the process, and full-time and part-time roving spaces for the community. “It will be a center that ignites creativity with all who walk in (like) our students, our community members, and our startups — those who will go on to create new businesses in the area,” said Megan Ellis, OWU administrative director of the Woltemade Center of Economics. Dan Charna, OWU assistant professor of business administration, said a seven-member advisory board will oversee the center and consist of two representatives each from the county, city, and university, as well as one at-large member from the entrepreneurial community. The goal, council was informed, is to have the center open in time for the start of OWU’s 2018-2019 school year in August. Council could sign off on the joint venture agreement as soon as its next meeting scheduled for 7 p.m. on Feb. 12 in council chambers at City Hall.